We already had a recent blog post on the possible "real" meteorite crater, which is thought to be responsible for the events marking the K/T Boundary. Now here is another interesting meteorite story: Geology recently published a paper on a hypothesis that the Sudbury Impact caused the end of banded iron deposition, at least in the Lake Superior region. The authors note that in the Lake Superior region of North America, deposition of most banded iron formations (BIFs) ended abruptly 1.85 Ga ago, coincident with the oceanic impact of the giant Sudbury extraterrestrial bolide. In their paper Slack and Cannon propose a new model in which this impact produced global mixing of shallow oxic and deep anoxic waters of the Paleoproterozoic ocean, creating a suboxic redox state for deep seawater. This suboxic state, characterized by only small concentrations of dissolved O2 (~1 µM), prevented transport of hydrothermally derived Fe(II) from the deep ocean to continental-margin settings, ending an ~1.1 billion-year-long period of episodic BIF mineralization. Slack, John F., und William F. Cannon (2009), Extraterrestrial demise of banded iron formations 1.85 billion years ago, Geology, 37(11), 1011-1014, doi:10.1130/G30259A.1. The blog list now shows a info icon+link (example) which will direct you to a short blog information page, which lists the blog info Geoblogosphere News holds e.g. feed Url, latest post title and date etc. Additionally this page has a PING link, which allows you to trigger a visit of Geoblogosphere News at your blog feed. PSICAT is a nice piece of Java software programmed by Josh Reed which is an excellent tool to draw sedimentological profiles. It was used and promoted within the CHRONOS project and Josh brought it to ANDRILL where he used it to document this exciting antarctic drilling program. The tool is useful for 95% of all cases when you wish to provide nice graphs and illustrations of your profile. However, it is a bit specialized on core descriptions. For example, if you need to document outcrops and you are used to describe it from the bottom to the top you will feel a bit lost, as PSICAT expects core descriptions which start at the top of each segment. On the other hand it is very flexible, you can for example add e.g. lithological styles and patterns etc..
For us developers it offers a cool XML export, which allows to use the data within other programs. For example, PSICAT data can be used in the ICDP core decription tool 'DIS' as well as within the extremely cool 'CoreWall' which is used for IODP. As far as I know PSICAT is going to be merged with the Corelyzer tool soon. ... What a coincidence, I just started writing this post on PSICAT and saw Johannes post on profile drawing software. Some of you may not yet have noticed the new geoblog survey which aims to collect representative data on the geoblogosphere. Sorry for using this rather unusual mass pingback to attract your attention on this.. but the survey will only be online until the first of November 2009. So please take the survey, it only takes some minutes.. So far, the Chicxulub crater has not convinced me as the source of the global iridium anomaly that marks the K-T boundary. Other extinction events have already been linked with trap volcanism (P-T boundary, T-J boundary [see also this blog entry]) and therefore I had always favoured the Deccan traps as a major contribution to the environmental changes that lead to major extinction at the K-T boundary. Now I might be able to have the cake and eat it. A structure known as the "Bombay High", which previously has been investigated as a reservoir of hydrocarbons, is now tentatively identified as a meteorite crater. Since the object that made this crater must have had a diameter of 40 km, comparable to the asteroid Ganymed, the crater should actually be classified as an asteroid crater. With a diameter of 500 km it would also be the largest known impact structure and much younger than impacts of comparable size. "It's hard to imagine such a cataclysm. But if the team is right, the Shiva impact vaporized Earth's crust at the point of collision, leaving nothing but ultra-hot mantle material to well up in its place. 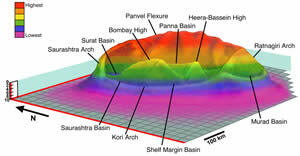 It is likely that the impact enhanced the nearby Deccan Traps volcanic eruptions that covered much of western India. What's more, the impact broke the Seychelles islands off of the Indian tectonic plate, and sent them drifting toward Africa. The geological evidence is dramatic. Shiva's outer rim forms a rough, faulted ring some 500 kilometers in diameter, encircling the central peak, known as the Bombay High, which would be 3 miles tall from the ocean floor (about the height of Mount McKinley). Most of the crater lies submerged on India's continental shelf, but where it does come ashore it is marked by tall cliffs, active faults and hot springs. The impact appears to have sheared or destroyed much of the 30-mile-thick granite layer in the western coast of India. The team hopes to go India later this year to examine rocks drill from the center of the putative crater for clues that would prove the strange basin was formed by a gigantic impact." If life had been around on the planet for three billion years already, why did multi-cellular organisms (metazoa) only appear 540 million years ago? But when multi-cellular organisms appeared on the plan, they radiated quickly into very many species. The radiation happened so fast, it was dubbed the "Cambrian Explosion". In a paper in print at Molecular Biology and Evolution Xavier Fernàndez-Busquets et al. looked at sponges to understand what holds them together in a way that is different to bacterial colonies. Sponges are the oldest extant Precambrian metazoan phylum and thus a valid model to study factors that could have unleashed the rise of multicellular animals. One such factor is the advent of self/non-self recognition systems, which would be evolutionarily beneficial to organisms to prevent germ cell parasitism or the introduction of deleterious mutations resulting from fusion with genetically different individuals. The molecules responsible for self/non-self recognition systems probably evolved gradually before the Cambrian period. Sponge cells associate through calcium-dependent, multivalent carbohydrate-carbohydrate interactions of the g200 glycan found on extracellular proteoglycans. Fernàndez-Busquets et al. propose that stronger cell adhesion allowed the integrity of genetically uniform animals composed only of "self" cells, facilitating genetic constitutions to remain within the metazoan individual and be passed down inheritance lines. Thus, the Cambrian explosion might have been triggered by the coincidence in time of primitive animals endowed with self/non-self recognition, and of a surge in sea water calcium that increased the binding forces between their calcium-dependent cell adhesion molecules. The increase of sea water calcium would be the product of increased tectonic activity and resulting chemical erosion. Fernandez-Busquets, Xavier, Andre Kornig, u. a. (2009), Self-recognition and Ca2+-dependent Carbohydrate-carbohydrate Cell Adhesion Provide Clues to the Cambrian Explosion, Molecular Biology and Evolution, msp170, doi:10.1093/molbev/msp170. Labels: Cambrian, Cambrian Explosion, metazoa, phylogeny pre-cambrian "early evolution"
Lutz Geissler, Callan Bentley and myself have prepared a new survey which aims to collect representative data on the geoblogosphere. The ultimate goal is to prepare a manuscript and submit it to an international geo journal to spread the spirit of the geoblogosphere. The survey will be online until the first of November 2009. First results will be presented at the AGU fall meeting by Callan. Coral reefs were among the systems hardest hit by the end-Triassic events. Volcanism associated with the breakup of Pangaea released enormous amounts of CO2 into the atmosphere. The increased greenhouse effect and the acidification of the oceans caused a widespread extinction. The large and highly diversified reefs of the Triassic disappeared. One of the few survivors was a reef situated in what today is the south of France. Wolfgang Kiessling of the Museum für Naturkunde Berlin (Berlin Museum of Natural History) and co-workers went at answering the question why this particular reef survived the extinction event and what lesson can be learnt for estimating the effects of the current environmental change through elevated atmospheric CO2 levels. The surviving European reefs later formed the nucleus for the re-radiation of corals. The recovery, however, took a very long time: 15 million years. In their work, published in the latest issue of Palaios, they come to the conclusion that the reef was situated in deep shelf waters at high latitudes in a region that had been a hotspot of coral reefs already through the Triassic. Their findings also highlight the importance of deep shelf regions for the survival of marine species. It is not always necessarily remote ocean islands. A while ago Jorge Cham had this wonderful cartoon on PhD Comic what it would be like if research papers had a comment section. Meanwhile, I found another example in the comments section at the Digital Curation Centre. Alfred Issendorf, a young dutch geology student is sent by his professor to the wilderness of Finnmark (Norway) to find proof of his advisor's hypothesis that certain lakes are meteorite craters. He has ambition but little talent and his quest soon turns into a real catastrophy. I strongly hope there is no real analogue for Issendorf now stumbling around in the bavarian Chiemgau. The story strongly reminds me on what currently happens in Bavaria where the glacial Lake Tüttensee and some other depressions have been declared to represent remains of a postulated 'chiemgau impact'. He wrote about the South African 'Peninsula Formation' which is a synonym for the 'Peninsula Sandstone'. Unfortunately, this 'Peninsula Formation' is homonym to the 'Peninsula Formation' from British Columbia. The latter is of Cretaceous age, whereas the South African was formed during the Ordovician! Geoscientists using stratigraphic terms surely have a clear concept of what they mean. However, whereas for human readers it may be easy to determine such a concept by lithological descriptions or the broader geological or tectonic context, this is much harder for computer algorithms and thus, agetagging. Fortunately, the regional context can easily be discovered by geotagging technologies, therefore the geographic concept of a stratigraphic term is most important. Stratigraphic homonyms may exist at much lower regional level, e.g. from different provinces or states and most likely there are also significant conceptual differences between scientists. etc etc. However, such regional concepts are sufficient for the approximation for our agetagging purposes. The concept of a South African 'Peninsula Formation' is surely completey different from the Canadian. .. a lot of complications with 'strato-semantic' text analyis.. stratigraphic analysis of geoscientific texts requires a combined approach, good agetagging is not possible without geotagging. Did Apollo 11 bring petrified wood from the moon? A treasured piece at the Dutch national museum - a supposed moon rock from the first manned lunar landing - is nothing more than petrified wood, curators say. 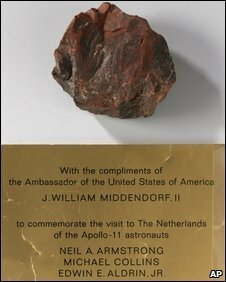 It was given to former Prime Minister Willem Drees during a goodwill tour by the three Apollo-11 astronauts shortly after their moon mission in 1969. The US agency gave moon rocks to more than 100 countries following lunar missions in the 1970s. The Rijksmuseum, which is perhaps better known for paintings by artists such as Rembrandt, says it will keep the piece as a curiosity. "It's a good story, with some questions that are still unanswered," Xandra van Gelder, who oversaw the investigation that proved the piece was a fake, was quoted as saying by the Associated Press news agency. A jagged fist-size stone with reddish tints, it was mounted and placed above a plaque that said: "With the compliments of the Ambassador of the United States of America . . . to commemorate the visit to The Netherlands of the Apollo-11 astronauts." The plaque does not specify that the rock came from the moon's surface. It was on show in 2006, and a space expert told the museum it was unlikely NASA would have given away any moon rocks three months after Apollo's return. But frankly, does it look like lunar basalt? Researchers from Amsterdam's Free University said they could see at a glance that the rock was probably not from the moon. They followed the initial appraisal up with extensive testing. "It's a nondescript, pretty-much-worthless stone," geologist Frank Beunk concluded in an article published by the museum. US officials said they had no explanation for the Dutch discovery. During my recent holiday in the Cape I visited my alma mater, the University of Cape Town and its Department of Geosciences. At his visit John Rogers of the geology department told me about his recent work on Table Mountain and later showed me some outcrops along the northern and western face of the mountain. The stratigraphy of Tale Mountain (Western Cape Province, South Africa) always seemed to be a perfect example of "layered cake" stratigraphy: the base is Malmesbury Shale and Cape Granite with the famous Sea Point Contact between the two. Both are truncated at the top by an unconformity. The succession continues upwards with some basal conglomerate in places, the tidal or fluvial Graafwaater Formation, followed by the fluvial quartzites of the Peninsula Formation and topped by some glacial till, remnants of the Pakhuis Formation. This package of Graafwater Fm. and Peninsula Fm. can be found in the Cape Mountains where it is highly deformed. The contact between the Graafwater Fm. and the Peninsula Fm. had always been interpreted as a conformable contact. By coincidence John Rogers noticed an angle between the Graafwater Fm. and the overlying Peninsula Fm., prompting the question, whether the contact between these two formations is actually conformable. Dating on zircons by Rogers et al. points to a significant hiatus between the two formations. The picture above shows Cape Point and Rooikrans at the southern tip of the Cape Peninsula. It is one of the prime tourism and field-trip stops. I had been here a few times before in the past twenty years, but neither me, nor seemingly anybody else, had noticed the prominent syncline/anticline in the Graafwater Fm. beneath an undeformed Peninsula Fm. My guess is that the folding is due to compression along a north-south axis because all observed folds dip along this axis. The quartzites of the Peninsula Fm. seem to be more competent. Instead of ductile deformation they show brittle deformation, e.g. a prominent reverse fault under Constantiaberg, the fault plain dipping to the south. This puzzles me and I will have to do more reading on the regional geology of the Western Cape. Why is the principal stress from the south if the nearby Cape Mountains were folded by a main stress from the west? How far did the Graafwater Fm. extend? Is there an angular unconformity at Lekkranskloof (near Heerenlogement and Graafwater)? Interesting new detail about the assemby of Gondwana. How much money is in the scientific data management 'business'? The answer to this question probably nobody knows... But, based on some numbers I know, I will give a rough estimate on how much money potentially could be made with scientific data management - in Europe. The 7th European Framework Programme (fp7) provides more than 50 billion € for research projects between 2007-2013. The structure of fp7 is quite complicated and it is almost impossible to find out how much of this money exactly is spent for bio- and geosciences. The themes 'Agriculture and Fisheries, Biotechnology' and 'Environment (including Climate Change)' alone are funded with > 3.8 billion €. So let's estimate the European Commission spends around 4 billion € for bio- and geosciences. To my knowledge, those European research projects which provide some money for data management, reserve 0.5-3% of the total project funding for this purpose. The mean percentage is about 1.5%. From the 4 billion I mentioned above, some projects may not need data management at all. However, if at least 75-80% of all research projects produce data, 1.5% of the remaining 3 billion € would include around 45-50 million € for data management. This seems to be much money, but the fp7 started in 2007 and will last until 2013, so the yearly amount of money for data management (DM) potentially(!) spent is around 6.5-7 Mio €. The potential market for scientific data management still seems to be considerable. Of course this money is not really spent. The percentage of projects which include proper data management is certainly below 75%. I would estimate less than 30% of all projects reserve money for data handling. Further, we need to consider that proponents from 27 member countries compete for this money (as little appropriate data centers exists the competition for the remaining millions is not as hard in reality...). I used the fp7 example, as the European Commission has shown considerable interest in improving open access to scientific data. As far as I know, this issue is also considered in project proposal evaluations. However, the money the European Commission spends is only one possibility for funding, ideally national funding agency will also support access to data. If you are living in a lucky country, national funding for DM could equal the amount the Commission spends. In summary, I think the scientific data management niche is still interesting, while there is not as many money you might have expected. However, as the importance of e-science infrastructures and open access to scientific information has only recently been recognized, this sector may still grow in the future. Today I read an advance online publication of van de Schootbrugge et al. in Nature Geoscience (doi:10.1038/ngeo577) on their interpretation of terrestrial mass extinction at the Triassic/Jurassic boundary. The role of wide spread volcanism at this time has been widedly acknowledged and its effect mainly attributed to CO2 emissions and consequent global warming. While this model explains the marine extinctions quite well, it does not fully explain the observed terrestrial extinction. Van de Schoortbrugge et al. argue that their field observations suggest widespread acid rain and low sunlight caused by volcanic emmissions. They also point out the role of polycyclic aromatic hydrocarbons, which are toxic and are produced by heating organic compounds, e.g. coal seams. Their findings strengthen the case that tectonics and resulting volcanism are major forcing mechanisms that trigger global mass extinctions. The parallels to the Permo-Triassic boundary are quite striking where some researchers suggest that the extrusion of the Siberian trap basalts throgh a major coal field would have also shown widespread ecological effects. In terms of media consumption we live in an economy of attention (see e.g. http://www.heise.de/tp/r4/artikel/6/6097/1.html) and it turns out that twitter as a medium fares low in this system, while -until now- the company that runs it was "hot stuff". Probably no longer. To me, the hype and fall of twitter is yet another example of disregard of patterns of social interaction. Does anybody remember "Second Life"? The way we conduct science is a real world social network, too. It has its own economy of attention (i.e. citation) and its interactions among network members are governed by trust. Therefore, any Web 2.0 approach to science must be in line with the cultural practices of the community it is designed to serve. Otherwise it will fail. Or, as I said at the AGU Fall Meeting 2007: "Beware of Geeks bearing gifts". P. Kyle House, University of Nevada, Reno, Nev.; John Bailey, University of Alaska, Fairbanks, Alaska; Ronald C. Schott, Fort Hays State University, Hays, Kans. ; Mano Marks, Google Inc., Mountain View, Calif.; Glenn A. Richard, Stony Brook University, Stony Brook, N.Y.; Peter A. Selkin, University of Washington, Tacoma, Wash. Sun., 18 Oct., 1:30–5 p.m.
Digital technologies such as Web 2.0 services, virtual globes, and new applications of digital photography can enhance understanding of geology at all levels and across all disciplines. This session will highlight particularly novel and innovative applications of these technologies. Despite I am convinced twittering is almost useless and is going to be a horrible waste of time for me, I could not resists and just created my own twitter account. As a student I had the opportunity to visit Iran during a university field trip. Since then I feel a lot of sympathy for the people of this beautiful country - not for everybody there of course.. I was wondering if there are any Iranian geoblogs out there and indeed there are some! Blogfa.com , is something like the persian blogger.com and I experimented with some links such as http://geology.blogfa.com and success.. I found: paleo.blogfa.com, petrology.blogfa.com and there surely are more. Just change the age parameter if you wish to apply other filters e.g. Triassic etc..
Members of the International Commission on Stratigraphy (ICS) have controversially discussed the Redefinition of Quaternary, Pleistocene, Neogene, and Pliocene during the last months. The discussion was initiated by the ICS to find a definete agreement on the structure of upper part of the International Stratigraphic Chart (See one of my older posts on the 'prelude' of this issue). “Status Quo” Proposal: Pleistocene Series/Epoch remains defined by Vrica GSSP. The base of the Quaternary System/Period is formally defined also by the Vrica GSSP, corresponding to the base of the Pleistocene Series/Epoch and Calabrian Stage/Age, and serving also as the Neogene-Quaternary boundary. “Quaternary” Proposal: Base of Pleistocene Series/Epoch is lowered such that the Pleistocene includes the Gelasian Stage/Age and its base is defined by the Monte San Nicola GSSP, which also defines the base of the Gelasian. In addition, the base of the Quaternary System/Period, and thus the Neogene-Quaternary boundary, is formally defined by Monte San Nicola GSSP and is coincident with the bases of the Pleistocene and Gelasian. With these definitions the Gelasian Stage/Age is transferred from the Pliocene Series/Epoch to the Pleistocene. “Neogene” Proposal: Pleistocene Series/Epoch remains defined by Vrica GSSP. The Pliocene Series/Epoch is split into two series/epochs named Lower/Early Pliocene and Upper/Late Pliocene, with the later composed of the Gelasian Stage/Age and with its base defined by the Monte San Nicola GSSP. The rank of the Quaternary is changed from system/period to subsystem/subperiod; its base is formally defined by the Monte San Nicola GSSP. As a result, the Quaternary is composed of the Upper/Late Pliocene, Pleistocene, and Holocene series/epochs. The Neogene System/Period extends upwards such that it includes the Miocene, Lower/Early Pliocene, Upper/Late Pliocene, Pleistocene, and Holocene series/epochs. The Quaternary proposal received the majority of votes in this first round. The results of the following second round of voting which only included the Quaternary proposal have recently been published here. And the winner is ... the Quaternary is back! The proposal received a 89% majority of yes votes. The proposal will now be forwarded to the IUGS Executive Committee for ratification. An exciting documentation on this historic discussion can be found on the new bulletin board of the International Stratigraphic Comission. Bruno Granier just published a new article on a case of micropaleontological fraud the microplaeontological community was confronted with during the last years. Abstract: Starting in 1996 and for almost a decade, M.M. Imam contributed to twelve papers published in international geological journals. These papers dealt with the micropaleontology and biostratigraphy of Cretaceous to Miocene series from Egypt and Libya. They were abundantly illustrated in order to support the author's findings and interpretations. However most photographic illustrations (189 at least) were fabricated with material lifted from the publications of other authors, commonly from localities or stratigraphic intervals other than those indicated by M.M. Imam. Some of you may already have noticed the new 'stratigraphic tag cloud' at Geoblogosphere News. After my first attempt to use the ageparser tool for stratigraphic indexing of geoblogosphere posts. This is a new attempt to add more semantics to Geoblogosphere News. Any post summary is now sent to ageparser which returns the 'most likely chronostratigraphic context' of this post. These tags are store in the database and used to build the tag cloud which is an attempt to give a quick overview of the weekly stratigraphic focus of the geoblogosphere. The fun part will be to use the temporal+spatial tags (agetags, geotags) to build some 4D search interface for Geoblogosphere News which will allow you to search for e.g. blog posts treating the Cretaceous of Spain..
After some rather quiet months, members of the Taxonomic Database Working Group (TDWG) have started to discuss the GUID (LSID) issue again. Beneath the never ending discussion on which identifier system (DOI, LSID, PURL, handle etc.) is best, some other interesting issues have been raised: does a GUID system need central services, does it need a business model (money) etc. Good point! But instead of questioning the trustworthiness of GUIDs in general we should start thinking on ways to ensure or at least enhance it. So, how can we REALLY trust? Surely not based on promises. But based on facts! Therefore, the only way such service providers (also archives, databases etc.) could prove their trustworthiness would be a specific audit procedure and certificates. There are some initiatives working on this. For example the German nestor group. 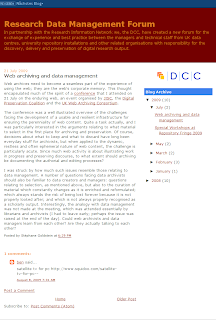 They developed a criteria catalogue for long term archives largely based on the OAIS model. Another check list is the TRAC list here. And there is the European DRAMBORA project which provides a repository audit method based on risk assessment'. The TDWG GUID group was focusing on technology, which was good to demonstrate a GUID system can work for biodiversity informatics. Now that we face these 'new' problems with GUIDs (business model + trustworthiness) TDWG should continue, revitalize the GUID group and care about these issues. A good starting point would be to develop such an audit procedure for LSIDs, based on the models mentioned above. TDWG (or some other organisation) could offer these audits and LSID authorities could get certified. This would enable them to demonstrate their trustworthiness, thus the persistence of their GUIDs. Such a certificate could electronically be assigned and added for example as a link to the LSID metadata. And why offering such audits for free? Maybe revenues from audit certificates could be one pillar of a future business model for LSIDs .. or TDWG? Software patents are a real pain! Especially when claimed by members of a research community. I was quite shocked when I read Rod Page's post Patenting biodiversity tools . Even worse to see that the same organizations - like uBio, which I was a big fan of - which make massive use of freely available information do apply for software patents! Biodiversity informatics is not the research area to earn the big money. So in this particular research context do we have to assume such patents aim to hinder scientific progress? Or what else can be the intention of such patents? Pre-Cambrian life is a truly fascinating subject. A recent study looked at the genetic evolution of 128 genes of 55 species to determine the order of early branching of taxa (sponge groups, ctenophores, placozoans, cnidarians, and bilaterians). One of the questions asked was whether the nervous system evolved once or twice in the course of early evolution. The study also sheds some light on the nature of sponges, a taxon that had already fascinated Charles Darwin at the beginning of his career. Labels: phylogeny pre-cambrian "early evolution"
Today two interesting blog posts about getting hold of geoscientific papers have been published: The Open Source Paleontologist lists several ways to find and retrieve pdfs on your own. Dave Hone picks this up and complains a bit about those people who are too lazy to use these resources but are asking copies directly from the authors-thus causing extra work. Surely, there are a variety of possibilities to find relevant literature on the web. But the majority of geoscientific papers are still published in commercial, closed access journals. So even if you found your artcle on Google Scholar, you'll frequently end on a page asking you for your credit card, unless you work for an institution which can afford the necessary licenses or it was publishe in an Open Access journal. Open Access is a fine thing and many interesting papers already appear in open access journals such as PLOS. The idea certainly will become even more popular in the future. But in my opinion it is unrealistic to assume that researchers will favor open access journals for their top results when they have the chance to get their 'Nature paper'. Other disciplines have reacted on this dilemma and provide and maintain so called preprint archives such as Arxiv. A preprint is a draft of a scientific paper that has not yet been published in a scientific journal. Preprint archives enable authors to quickly circulate their results and most important: copies of archived preprints are freely available! Unfortunately, there is no dedicated geoscientific preprint archive :(( You can find geoscientific preprints in some institutional repositories and postprints on some homepages etc.., but there is no common access point. But it should be there! Could a geo preprint archive be a community effort? Of cource it had to include the community, but could a community driven archive work? Alternatively, libraries could take on that responsibility. So... geolibrarians could you hear me? Give us a working geo preprint archive, ..please.. (maybe you could call it Geoxiv;) ). Sure, motivating the geo community to contribute will not be an easy job, but maybe one just has to start? The International Stratigraphic Commission has started an interesting discussion on the future of the Neogene and Quarternary on it's new bulletin board. Two position papers on the definition of the boundaries of the Quaternary, Pleistocene, Neogene and Pliocene are presented there. The NS regards the Geliasian as part of the Pliocene while the QS includes the Geliasian to the Pleistocene. The complete position papers can be viewed at stratigraphy.org. At the time, the cyberinfrastructure programme in the US was not even a year old and with CHRONOS and GEON two major projects had been launched. Sedimentary geology and palaeontology, two traditionally fractioned fields, had to make sure they don't fall by the wayside. Meanwhile, the scene has changed dramatically. CHRONOS has faded away, GEON is only a shadow of its former self, and PaleoDB is scrambling for the necessary funds. New kids have appeared on the block and seem to be far more popular with the community, which also translates into NSF support. Being less bullish with the community than the old champs seems to pay off. As CHRONOS faded away it also let go of the domain igeoinfo.org and iGeoInfo became virtually homeless. A few attempts were made to revive it, but the absence of a common goal led the remaining participants to the conclusion that this wandering soul could now be put to rest. iGeoInfo may rest in peace. Some of you already noticed (and clicked) the nice 'favorite' icons/links which now appear near each blog post summary at Geoblogosphere News. If you like a blog post you can now recommend it by clicking on it's star icon, the number of recommendations is then displayed beneath the icon. This is my first 'real' community involvement experiment with Geoblogosphere news (except the 'add blog' page) and I hope you like it? In the moment the recommendation procedure is very basic,I will surely have to add one additional step which will ask you to confirm the recommendation (you just recommended blog post XY are you sure Y/N?) and maybe some captcha to avoid 'geoblogospheric recommendation robots' ;)). Geosciences e-Journals is a new portal for freely available (Open Access) geoscientific journals. It provides an impressive collection of links to open access journals and contains much more valuable information such as editorial board members, author instructions etc.. The website of the International Stratigraphic Commission has recently been updated. The content is more or less the same, but the structure looks better now. For example, access to the latest Stratigraphic Chart now is offered immediately at the start page. I like the new design, the site looks much nicer than before. In an earlier post I have commented on ICS's chart publication and update strategy which obviously has nor changed: Still there is no version information available but at least the chart now contains the publication date in its title and file name. Older versions of the chart are still not available at stratigraphy.org. Interestingly, stratigraphy.org now has a web forum (!) so ICS is probably looking for some public dialog. This week I finally found some time to care a bit about my Ageparser tool. Ageparser is a text mining service which is able to find stratigraphic terms within a text/document. In a second step, these terms are used to find their chronostratigraphic age in the Agenames database. The idea was to provide a service which would analyze a text and determine it's chronostratigraphic context. You could upload a document and it would say: this text is about the Cretaceous. However, in some cases Ageparser gave some very strange results, e.g. if it discovered the term 'Canadian' in a document it returned 'Lower Ordovician' as possible stratigraphic context. I therefore had to implement something which at least gives an estimate on the credibility of such an age determination. The current solution is that Ageparser calculates a credibility index (between 0 and 1) which is based on the frequency of a determination as well as on the diversity of terms for a given age. The assumption behind is that the credibility of a age determination better if e.g. someone uses many different stratigraphic terms (different formation names or stages) of a distinct system. So I think Ageparser is now ready to leave the alpha status and get beta now.. well and I have to start to prepare a publication on it. First: a little Google chart API map shows a quick overview, the image here shows the first try. (The Geoblogosphere seems to be quite US centric;)) I have placed this beneath the tag cloud..
Second: a click on this map brings you to a Google maps where all geotagged blog posts are shown. Looks quite nice.. however, sometimes results are quite strange, e.g. the geoparser insists placing blog posts containing 'Darwin' in Australia! some search functionality which allows full-text queries on blog. This week's hottest geoglobospheric topic seems to be Darwin..
Well, here is something to contribute to 'Blogging about Darwin' and has at something to do with Snet: A TaxonConcept query for 'darwin' discovers 12 taxon names containing the term darwin in the second epithet. It seems as if these taxa have been introduced to honor Charles Darwin. As you can see in the result list, there are a variety of possibilities to latinise Darwin's name there is darwini, darwinii, darwinianus and darwinianum. I found it also rather astonishing that some of the names have been assigned by d'Orbigny to honor Darwin as early as in the 40th of the 19th century! But obviously Darwin and d'Orbigny knew each other quite well frequently exchanged letters. The TaxonConcept results list is by far not a complete list, for more results you can check also other databases such as ubio, which shows >300 matches for 'darwinii'. Here you will also find some names containing darwiniana.. Some blogs, e.g. DigitalKoans or NeuroDojo have reported about a new "Google" peer review tool called GPeerreview. Despite the leading G in it's name it certainly is not a member of the Google family but simply is published at and hosted by "Google Code" which led to some confusion. However, the concept of GPeerreview is very interesting and might influence the future of scientific publishing. GPeerreview is mainly a piece of software, "a command-line tool that makes it simple to write a review of someone's work and digitally". But the review concept itself significantly differs from the traditional peer review process, as the author of a (electronic) publications would have much more influence on the whole procedure, and it would allow authors to use a peer review process outside the world of scientific journals, e.g on their homepages and -halleluja!- blogs! Enhance the acclaim of your already-published works. My new year started quite strange: I had a horrible eye infection which forced me to stay in the hospital for one week and of course kept me away from my laptop for some weeks. The good thing about that was that I had a lot (!) of time to think about new projects. Discover how open OneGeology is: OneGeology is based on OGC standards (I assume at least) it would be interesting if OneGeology offers a common access point to OGC services such as WMS or WFS or maybe something like a develloper API to reuse it's data. This is something I'll definetely will check out soon. Start a 'Open Geology Maps' project: this could be something which is similar to the Open Street Maps Project but deals with geological maps. There must be thousands of geologigal maps out there which have been drawn by students, scientists and amateurs after field work and now rest in piece somewhere. It would be interesting to offer a website where these maps can be uploaded and integrated e.g. within Google Maps. Work on a Geoblog tagging system: This system probably is going to be reality sometimes... the idea has meanwhile been discussed on Chris Rowan's blog and was mentioned before on Michael Welland blog. This is just a short update on the latest changes of Geoblogoshere News. Geoblogosphere News now shows the latest Geoblog articles from the current week, before it just took the latest 100 or something enties from it's index. You can now check older blog articles by following the link '>>last week>>' which is a bit hidden on the bottom of the page. Blogs are now categorized by language and by clicking on one of the languages listed on the top of the page you'll see blog articles of the selected language only. There is a News Feed available at http://geoblogs.stratigraphy.net/feed.php. The list of blogs is growing .. check http://geoblogs.stratigraphy.net/?action=list !